Sometimes it's tough to tell whether something's a sign of the Apocalypse or a sign that everything's really alright with the world. 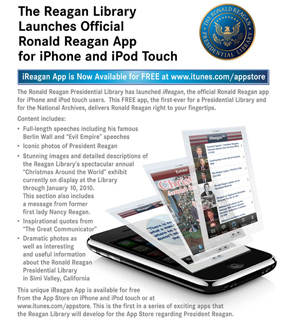 Today, I got an email from the Ronald Reagan Presidential Foundation. In it, I was offered the official iReagan application for my phone. Seriously. * Inspirational quotes from "The Great Communicator"
It's free, so it's kind of a no-brainer for all Republicans. Or is it? It's been taken as almost sacred canon that if you're a Republican, you love Ronny. But what if you're a Conservative? Or a Tea Bagger? What then? After all, Mrs. Reagan made an impassioned plea to the Democrats (of all people) in favor of stem-cell research. Is she conservative enough? If you're a Tea Bagger (the political leaning, not the lifestyle choice), can you even like someone whose widow supports stem-cell research? And that brings us to the bigger issue. Is it honoring the 40th President of the United States by carrying him around in our pockets? Or is iReagan some sort of idolatry, carrying him around as almost a pocket saint and peon to a wistful and warped memory of the go-go 80s? As the Republican party searches for meaning and identity, where does Ronny fit in? And if it's not clear where Ronny fits in the diaspora that's today's GOP, what is today's GOP? Will it be able to form a real identity by next fall's elections and will it find one leader to rule them all by the 2012 elections? Or will there really be a Conservative Party, a Tea Bagger Party, and, perhaps, the broken shards of the once-proud Republican Party? I don't know, but now that I've got Ronny-in-the-pocket, I'm definitely going to consult my own, personal iReagan. A pocket Ronnie will not repair a broken party on either side. Both sides are in troubled waters and the outcome is unclear as to how voters will turn that into results at the polls, from mainstreet to capital hill. Technology cannot turn the tide of anger and desperation just looks like desperation blue or red.